Serotine Bats are most common in the south-east of England; they are also known to roost in the westcountry and occasionally in South Wales. 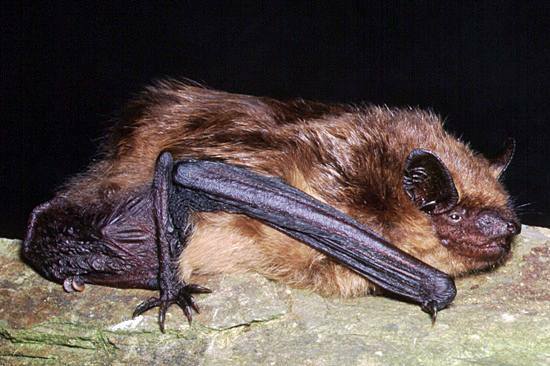 This is one of Britain's largest bat species, having a wingspan of typically 37cm and weighing up to 35gm. Its lifespan is known to be up to 19 years. Serotine bats have large, well separated ears. Serotine Bats emerge relatively early in the evening, Their flight is characterised by slow, looping glides and steep dives to seize their prey. In springtime the diet of Serotine Bats mainly comprises moths and other small insects, but when the summer night-flying beetles emerge Serotine Bats are quite large and powerful enough enough to cope with such meaty morsels too. Serotine Bats are sometimes seen around steet lamps in towns but their preferred hunting grounds are woodland edges and scrubby grassland. 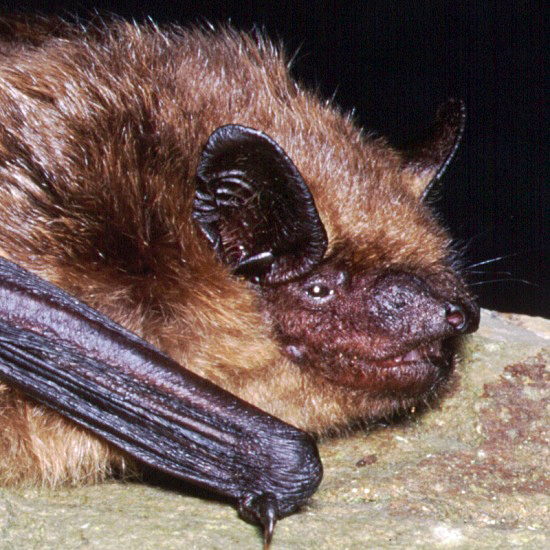 Summer colonies of a dozen to fifty Serotine Bats have been found in the lofts of houses and other buildings, which is usually where they hibernate. Female Serotine Bats form maternity colonies in May and give birth, nearly always to just one youngster, in July or early August. The you are capable of flying when just three weeks old, and by the age of six weeks they are able to forage for themselves and no longer depend on their mothers.